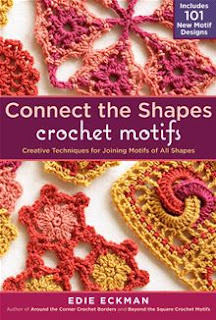 Connect the Shapes Crochet Motifs- Creative Techniques for Joining Motifs of All Shapes by Edie Eckman is both a crochet techniques book and a motif pattern book. In the first part of the book, the author goes over the basics about how to read international crochet notation or charted patterns and combine that with a text pattern for very clear instruction on how to work the pattern. She discusses color theory and balance, then gets into the techniques. Joining motifs, especially those with picots, mesh or lace edging can be tricky. With a solid edge, you can just slip stitch, sew or single crochet the motifs together. Join as you go or JAYGo edgings can be more difficult. She walks you through, step by step with clear instructions and good photographs with bright yarn that's easy to see how to do those joins in a few different methods. Advanced beginning and intermediate crocheters will appreciate the clear instructions. I learned a few things that make for smoother, nicer joins. She also discusses ways to adapt a pattern to a bulky yarn, or for a different effect. Some threads for example would make picots too tiny to join with the chain 3, so she suggests up sizing those picots. For bulky yarns and bigger motifs, they can become distorted, for those, she suggests ways to reshape the corners for less distortion. My favorite crochet books aren't full of patterns for finished projects, they are stitch techniques and motifs for creating my own projects. This book is going on that shelf. The one with the stitch guides and motifs that I refer to when starting a new shawl or another project. My favorite motifs are the kind that tessellate together nicely which means 3, 4 or 6 sides. There are a lot of them in this book. In fact, as the cover says, there are 101 total motifs and most of them are tessellating motifs that can be joined directly together. The motifs cover a wide range of stitch techniques.This includes some of my favorites like front post stitches where you work the stitch around the post of another stitch rather than into the chain top. This creates a nice dimensional effect, and worked in a different color than the previous round also makes lines of a different color on top of the previous colors. There are lots of intricate looking laces that are really easy to make and a few that are super easy to memorize. Make a couple at home, then carry yarn and a hook to continue making more while you're out doing other things. Each motif also has tips specific to that motif for adapting the joins if necessary. After that, there are a few patterns that use motifs, such as a curved pillow that takes advantage of a distortion in a triangle motif. The distortion can be eliminated with different stitch counts for things that you want to lay flat, but for the pillow, the doming is perfect. Several patterns show some of the versatility of the motifs. My favorite is the flower garland which has a lovely, soft spring look. At the end of the book is a chart to refer to if you are having any issues with understanding the stitch symbols. It's a nice complete chart that will work for all the patterns in the book. There is also an index of motif patterns that's laid out with images of the finished motifs. You can browse through the images to find just the right shape and look for your pattern. If you love motifs for making shawls, afghans or even fashion scarves, or if you've had problems understanding how to read a charted pattern, this book is a great choice. Spiral bound in a hard cover to lay flat while crocheting.